Join us for a new art exhibit at Central Library in Jamaica from January 7 to March 2 that honors the artistic talents and cultural contributions of new immigrants. 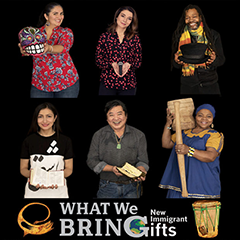 What We Bring: New Immigrant Gifts adds to the national dialogue on immigration. Focusing on the cultural contributions of immigrants who came to the U.S. in the fifty years since the Immigration Reform Act, "What We Bring" celebrates the rich layers of creativity, tradition, and increased cultural diversity that the law set in motion, especially in New York City. The exhibit's opening reception will be held on Thursday, January 10 at 6pm and feature Malini Srinivasan, DJ Anuva, and more presenting the arts of the South Asian diaspora. Learn More about What We Bring: New Immigrant Gifts. This exhibit is cosponsored by City Lore, the Center for Traditional Music and Dance, the Brooklyn Arts Council, and the CATCH consortium, and funded by the Andrew W. Mellon Foundation with additional support from the New York State Council on the Arts and the NYC Department of Cultural Affairs.